Download "About the Model. Unit. Cost Structure. 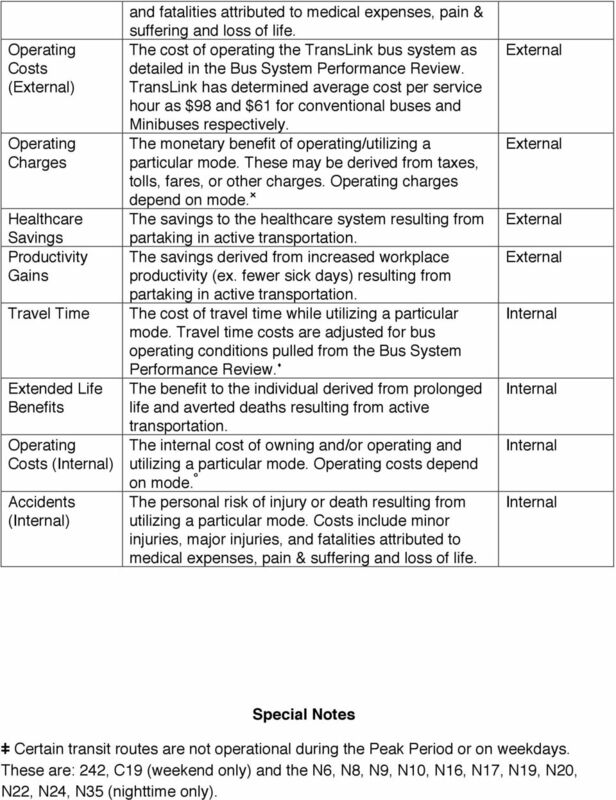 Modal Characteristics"
3 Operating Costs () Operating Charges Healthcare Savings Productivity Gains Travel Time Extended Life Benefits Operating Costs () Accidents () and fatalities attributed to medical expenses, pain & suffering and loss of life. 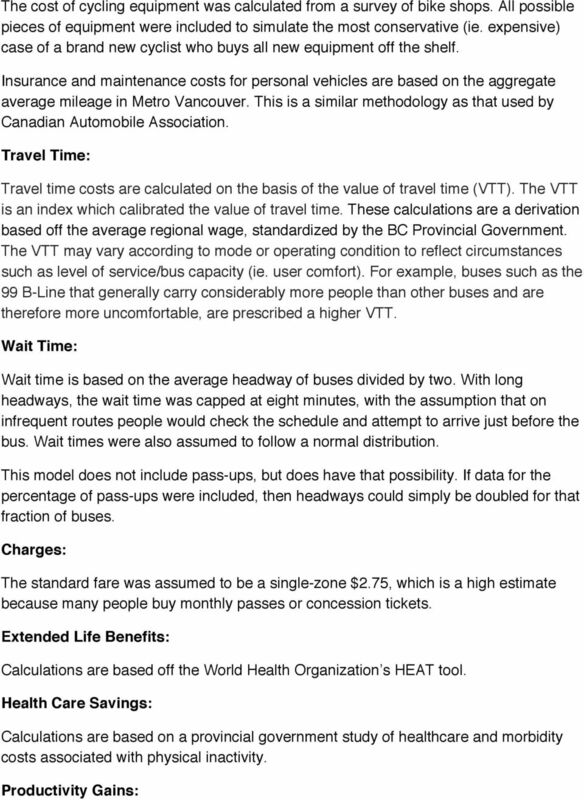 The cost of operating the TransLink bus system as detailed in the Bus System Performance Review. TransLink has determined average cost per service hour as $98 and $61 for conventional buses and Minibuses respectively. The monetary benefit of operating/utilizing a particular mode. These may be derived from taxes, tolls, fares, or other charges. Operating charges depend on mode. The savings to the healthcare system resulting from partaking in active transportation. The savings derived from increased workplace productivity (ex. fewer sick days) resulting from partaking in active transportation. 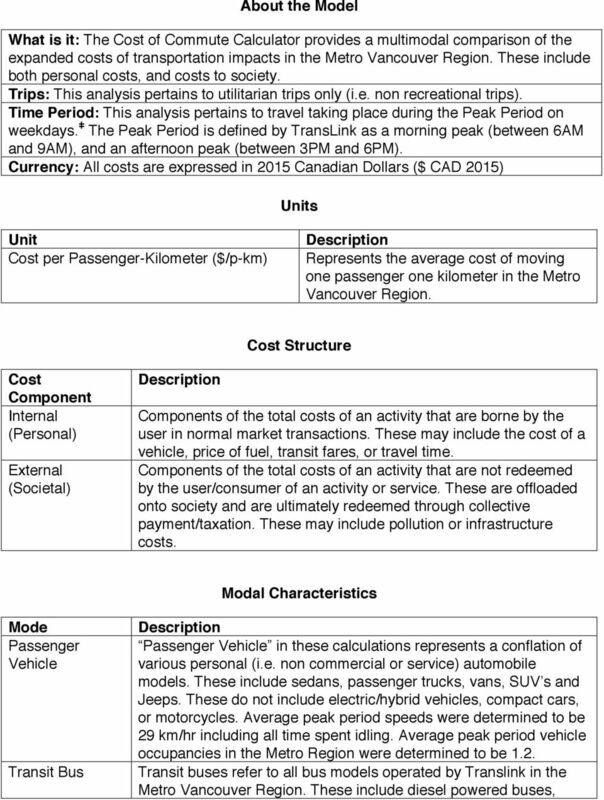 The cost of travel time while utilizing a particular mode. 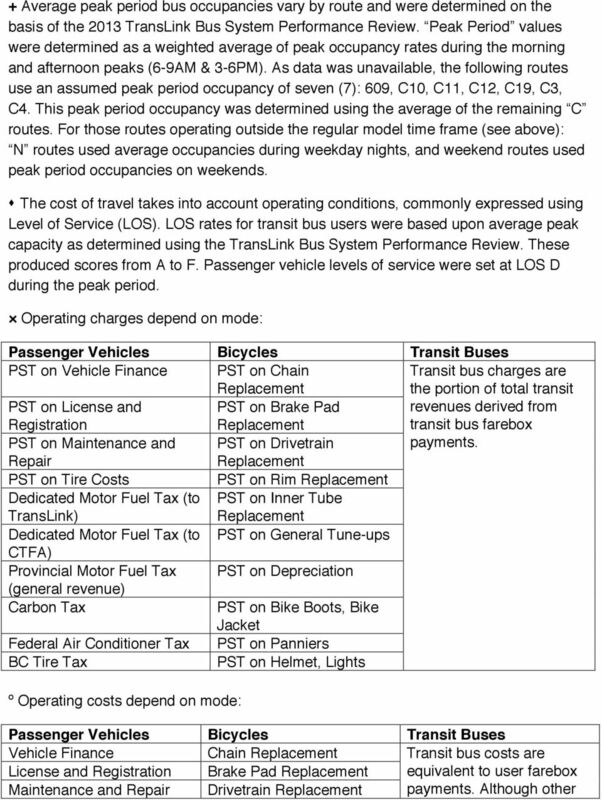 Travel time costs are adjusted for bus operating conditions pulled from the Bus System Performance Review. s The benefit to the individual derived from prolonged life and averted deaths resulting from active transportation. The internal cost of owning and/or operating and utilizing a particular mode. Operating costs depend on mode. º The personal risk of injury or death resulting from utilizing a particular mode. Costs include minor injuries, major injuries, and fatalities attributed to medical expenses, pain & suffering and loss of life. Special Notes ǂ Certain transit routes are not operational during the Peak Period or on weekdays. These are: 242, C19 (weekend only) and the N6, N8, N9, N10, N16, N17, N19, N20, N22, N24, N35 (nighttime only). 7 Productivity Gains are from the same study as above, but differentiated by the entity paying the cost changes, as there is a softer cost that comes with inactivity, like sick days, paid indirectly by businesses. 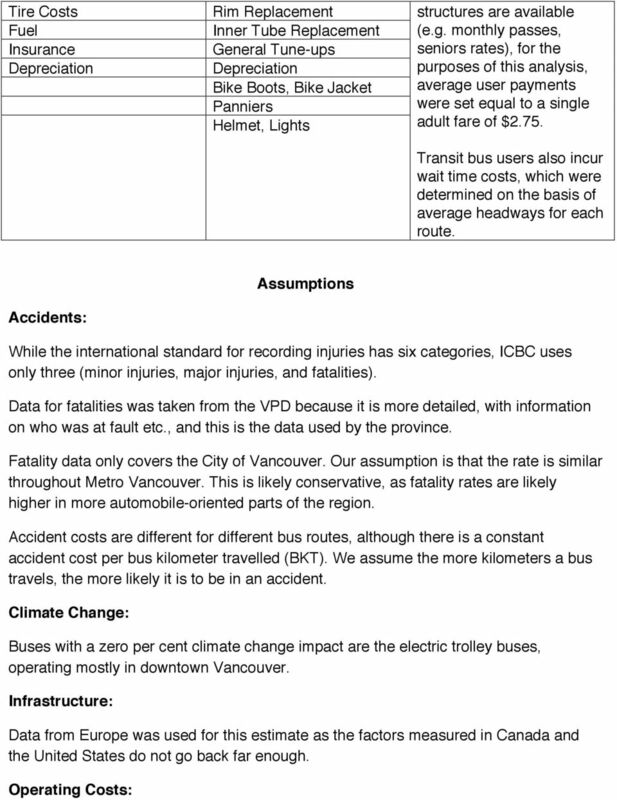 Not Included: Costs and benefits that were unavailable for this analysis, but significant enough to warrant future investigation include: specific infrastructure costs for buses (i.e. bus shelters, signs, benches etc. 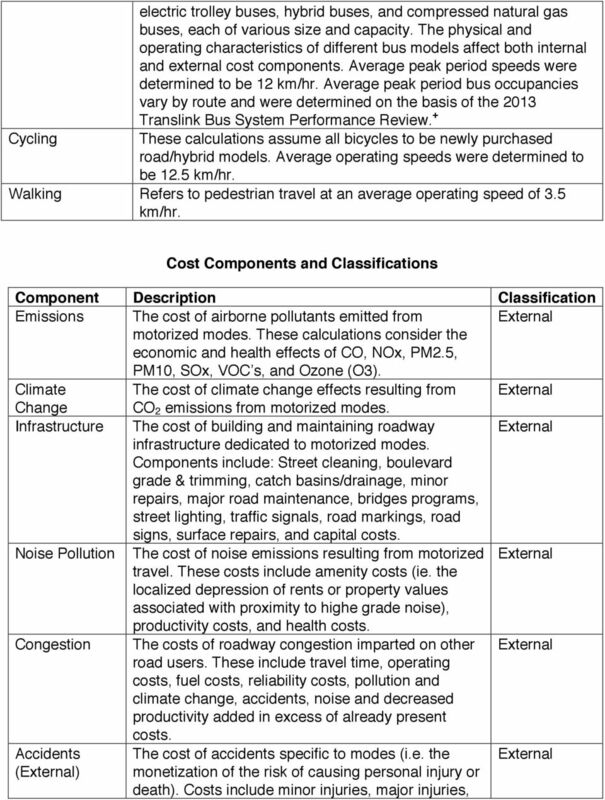 ), infrastructure costs for cycling and walking, parking costs, roadway land value costs, transportation diversity costs, land use impacts, water pollution and hydrologic impacts/costs and waste disposal costs and/or life cycle costs. A capital cost that is relatively small but could be significant is the overhead electrical cables to run the trolley buses. Data was not available. Where Do We Want to Go? How Can We Get There? BICYCLE TRENDS IN CAMBRIDGE Cambridge promotes bicycling as a healthy, environmentally friendly way of getting around as an important part of the City's efforts to improve mobility and protect our environment. This document is part of a series of Building a Stronger South Australia policy initiatives from the Government of South Australia. 6. Cost Summary and Analysis This chapter summarizes and analyzes the cost estimates from previous chapters. An integrated approach to develop the transport system of Metropolitan Helsinki Suvi Rihtniemi 22.5.2013 Helsingin seudun liikenne -kuntayhtymä Welcome to Helsinki Region Contents of the presentation 1. Juha Luoma and Michael Sivak. The University of Michigan Transportation Research Institute Ann Arbor, Michigan 48 109-2150 U.S.A. Safe cycling: How do risk perceptions compare with actual risk? To get started you will need a box of file folders or a box of 8 ½ x 11 envelopes. always in a rush Are you Rushing to work Rushing home Rushing off on vacation?